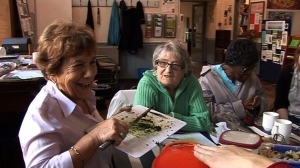 The film documents the final session of Memory Soup, a six week project with the Canonbury Elders jointly run by the Clod Ensemble and artist Jemima Burrill through Well London's 'Be Creative Be Well' project. This short edit of the material and the recipe cards below were also presented in the new centre, 'The Bridge' in March, for those who took part. Interviews taken towards the end of the event discuss how the sessions have affected participants and provide an overview from the organisers. To watch clips of the event follow the links below to the Spectacle Archive. A Chat with Danny: Filming, interview and editing by Hervé Nourisson and Tom Lister. Interviews with a dance group who come to The Bridge weekly to tango, waltz and quickstep - interview conducted by Tom Lister, camera by Iris Tuckfield, Hervé Nourisson and Tom Lister. Clips from Well London, along with footage from other Spectacle projects, can also be viewed in the Archive. To view related articles and discuss issues raised in these clips please visit the Spectacle Blog. Download the Islington Active Living Map below.